Premise: Three couples compete in a series of three rounds in order earn a chance to play for all five of their selected prizes plus a bonus holiday in the end game. In the first round, the teams are shown nine categories, consisting of nine questions each. Each team selects a category and must answer questions correctly in a row to earn any points. Once a team answers a question incorrectly before answering all nine questions correctly in a category, the team’s turn ends. The team with the most correct answers on each turn gets to “unwrap” one of their gifts. The round ends once each team has played two categories. In the second round, each team takes a turn filling in the missing item from a series of lists (ex. : Numbers 1-5: 1,__, 3,4,5). Each correct answer unwraps a team’s gift. The first two teams to unwrap all five of their gifts, advance to the third round. In the third round, each team is faced with five multiple choice questions, each containing three possible answers. Each question may have one, two or three correct answers. Both teams alternate turns, whether they answered correctly or incorrectly. The first team to correctly answer all five of their questions, unwraps their holiday bonus gift and advances to the final round. In the end game, the winning team now has the chance to win all six prizes, including the holiday trip. One contestant is sent off-stage in a soundproof area. The other contestant remains on-stage and is given six subjects and must create a list to describe each subject. The contestant is given 5 seconds per subject. Afterwards, the off-stage contestant is brought back and must guess what each subject is based on their teammate’s list of clues. The team wins a prize for each correct answer given. 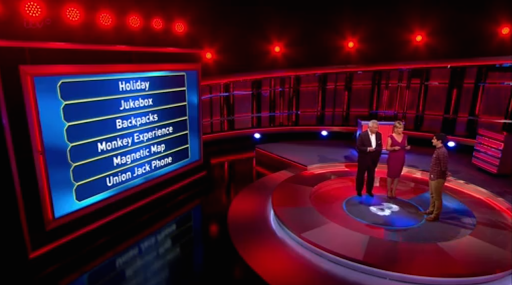 There are game shows that are primarily known for its unique gameplay, like Jeopardy! and Password, and there are game shows that are solely known for its gimmicky premise such as You Deserve It and Take It All. Gift Wrapped falls under the latter category in the sense that it’s simply a regular quiz show encompassed around the necessary gimmick of the couple’s choosing their own prizes to win. Gift Wrapped is another good filler show for ITV while The Chase is on its break, although it’s good enough and worthy to become a primetime series. I will admit, I was a bit concerned with the show flow seeing how the first round dragged a little bit. But, the following round compensated for the first with the increased pace of the “missing links” catch-up round. 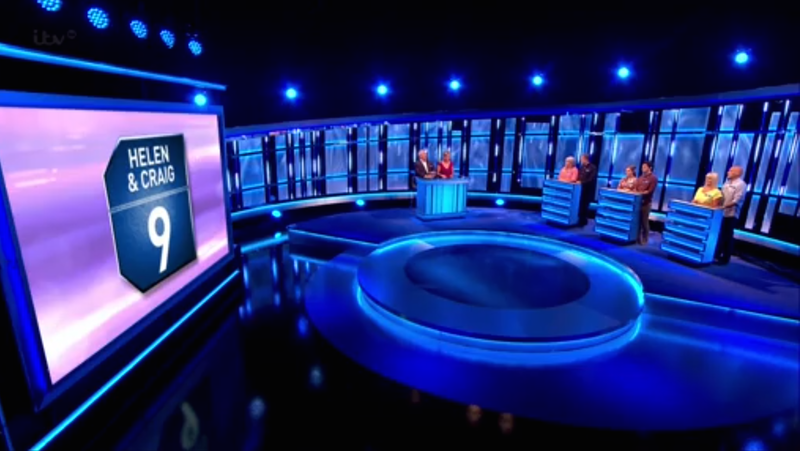 The show creatively combines various elements from other game shows including Pyramid (seen in the end game), Only Connect (seen in round two) and Wipeout (seen in round three). As hosts, Eamonn Holmes and Ruth Langsford are the perfect hosts for this format. Perhaps the nation’s most beloved real-life TV couple carryover their excellent hosting skills along with their warm, consoling and calm demeanor from hosting the U.K. morning show, This Morning, to this new daytime series. Their great chemistry reminds me of Allen Ludden and Betty White when White would appear as a gust panelist on Password and Password Plus, although the couple never hosted a show together. The only minor issues I have with show, besides the slow-paced first round, are within the set and the bonus game. For the set, the one change I would make is replacing the lights representing the number of unwrapped gifts on the couples’ podia with readouts displaying what the unwrapped gifts are as a courtesy to the home viewers to remind them of what each couple is playing for throughout the entire front game. With the bonus game, the one change I would make is giving the winning couple one final chance to win all six prizes by playing one more list, should the couple fail to initially win all six prizes. 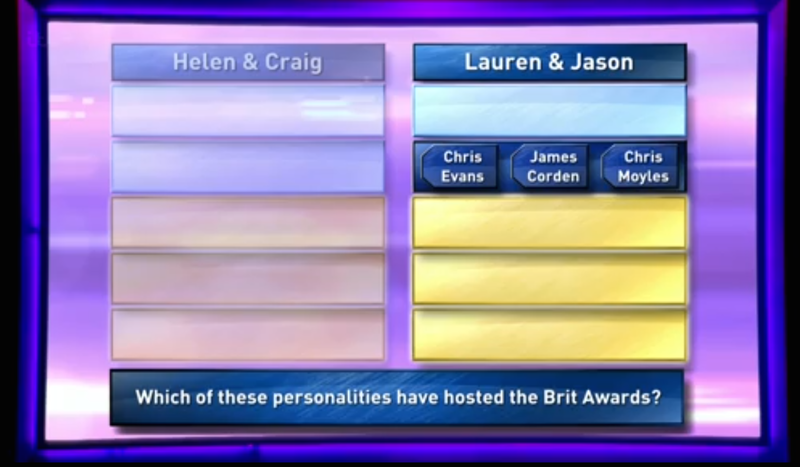 Should the team play on and miss the final list, the couple would receive a £500 consolation prize. Overall, even though it’s not the first game show to conceptualize the idea of contestant’s picking their own prizes to win on the show (e.g. : Scrabble Showdown, Where In The World Is Carmen Sandiego? ), Gift Wrapped is good, solid addition to ITV’s weekday daytime lineup. I predict this show will receive the the second-series nod and hope to see more of Gift Wrapped in the future. Watch new episodes of Gift Wrapped weekday afternoons at 4:40pm BST on ITV! Next Post Quick Review of "Two Tribes"